Number 14 takes a tour. Number 14 and 15 remain in the area this weekend but both are spreading their wings. On Sunday Number 14 did an early morning circuit of Bassenthwaite Lake. At 6.00am he was below the viewpoints on the river, by 7.00am at the other end of the lake and by 8.00am over the A66 near Barf. How long will they remain with us? Will any of them disappear before the project comes to a close on Sunday? Next download due on Tuesday. The Young Ospreys spread their wings. 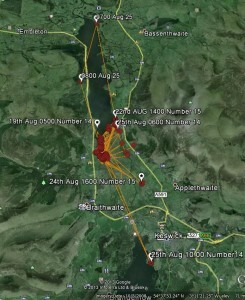 Both our young ospreys are now making significant flights. 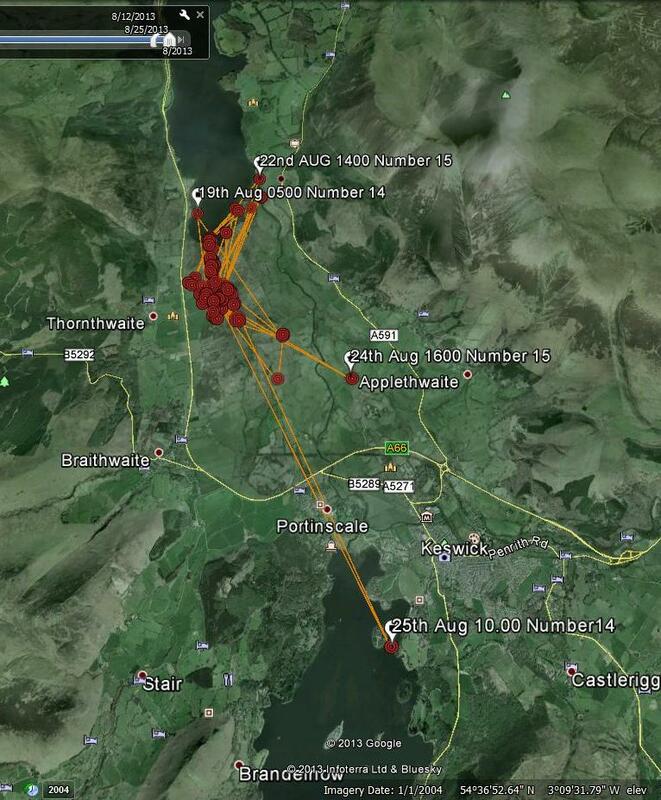 Number 14 could have been seen on Sunday morning over Derwentwater – Portinscale, Crow Park area. Number 15 meanwhile has been exploring the River Derwent and Bassenthwaite Lake. If you get any good sightings or even photographs do let us know. Meanwhile the Osprey viewing sites are beginning to wind down so get along to Whinlatter or Dodd Wood to chat to our wonderful volunteers and staff as soon as you can. The last day of assisted viewing is Sunday 1st September. Lake District Osprey Projects young birds growing up. As we enter the Bank Holiday week end with reasonable weather forecast for Sunday and Monday we can report that there is still a good chance of seeing ospreys from the viewpoints at Dodd Wood and on the screen at Whinlatter. If you double click on the map above you will see that both young birds are moving around. The yellow pin is Number 14, the green pin Number 15, the purple pin denotes both together. Young Number 14 seems to have spent his first night away from the nest and both have reached the lake. As well as Ospreys we have also had good views of Lizards and Red Squirrels. Both Dodd Wood and Whinlatter Forest Park were both recommended recently by the BBCs WildLife Magazine as good places to see Red Squirrels, something we’ve been saying for a long time. A Green Woodpecker has also been seen several times between the viewpoints. With just over a week to go before you lose the services of our trusty volunteers why not get along to the LDOP as soon as possible? 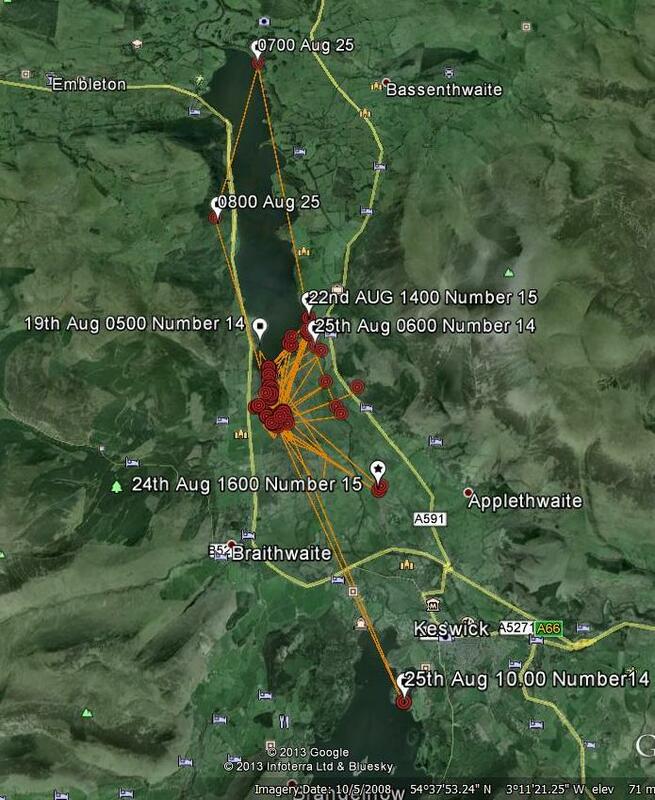 The Lake District Osprey Project goes to the Bird Fair. At the end of last week Nathan and Phil from the Lake District Osprey Project (LDOP) team travelled down country to visit the annual Birdfair at Rutland Water – another place renowned for its Ospreys. Not only did they get the chance to catch up and have tea with the Rutland Osprey team, they also gave a lecture about the Lake District Ospreys to an appreciative audience from the bird watching community. 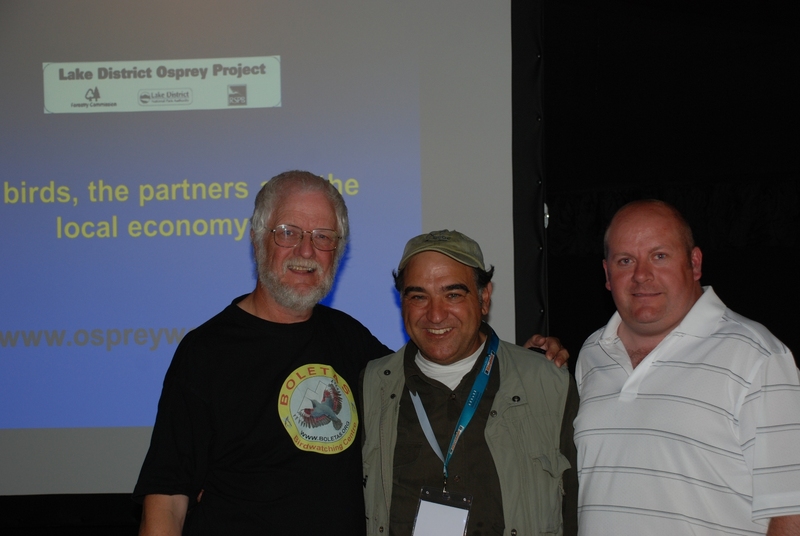 The highlight of the day was when Josele J Saiz from the Boletas Birdwatching Centre, Aragon, Spain presented a substantial donation raised for the project from trips to West Africa. The LDOP wish to give special thanks to Josele and the volunteers, that link our organisations together. 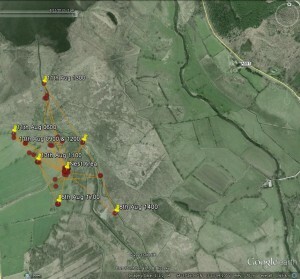 More information on Josele’s excellent birdwatching trips can be found at www.boletas.org. Also, thanks to Tim and the Rutland team, who made us very welcome, and were instrumental in making the day possible. Number 14 on the move. Our young male Osprey chick White 14 fledged last Tuesday. 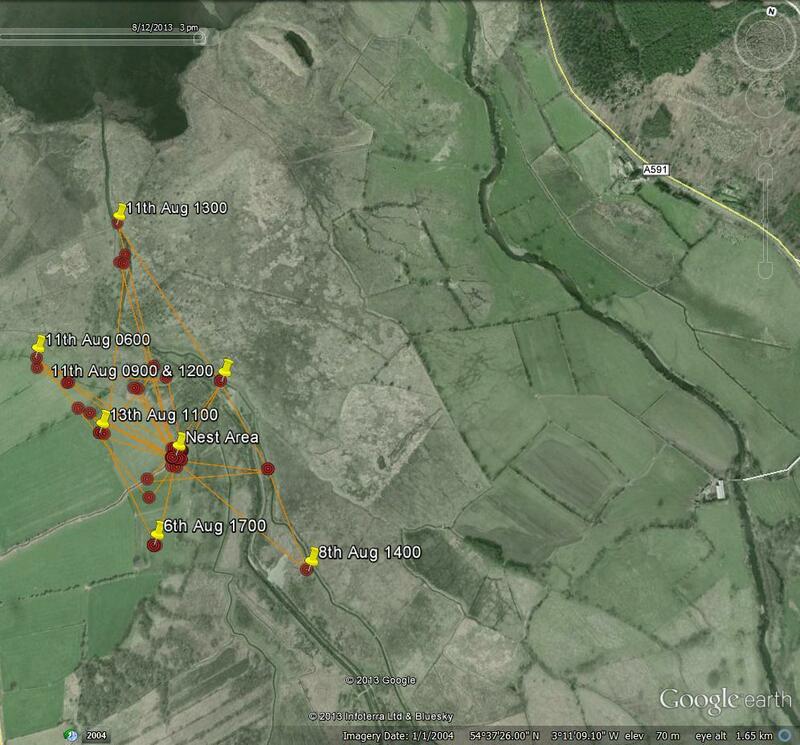 The map above shows where on the marsh he has been located since. The viewpoints are in the top right hand corner. For 13th please read 12th (sorry got ahead of ourselves there!). Our young female, White 15 has also now fledged. She left the nest on Thursday 8th August at 3.00pm. She has not, so far, covered the same area and remains within the markers set by the male. Chick 15 left the nest on Thursday just before 15:00, much to the delight of the watching crowd at Whinlatter and our volunteers Elspeth and Mary, who were on duty at the time. The osprey family are now all airborne and both chicks are finding their wings, perfecting their landings and slowly coming to terms with the momentous event that being able to fly brings. Fledging is a true highlight of the season, and a defining one for our staff and volunteers, who have dedicated thousands of hours of their time protecting 14 &15. Whereas our work for the season is nearly done, we can all sleep a little easier now, knowing that this tremendous team effort has once again provided these young birds with the best possible start to their lives. For the last 5 days at least we have been watching the chicks on their jack-in-the-box progress towards the final spring from the nest. Vigourous flapping, holding on by the tips of a talon, leaps of up to 60cm (2 ft) and in one case a filght from one side of the nest to the other over the top of Mum! Yesterday it all calmed down in the rain as flight feathers grew heavy with moisture and the thermals drooped earthwards. This morning was still overcast but dry and by this afternoon sunshine was out with a very light breeze. Ideal conditions. First male 14 and then female 15 would take it in turns to dance lightfooted around the nest in a whirr of wings. In between preening and oiling feathers became top priority. At Whinlatter’s screens visitors came, stayed glued to the spectacle and then reluctantly moved off. The last family stayed on past closing time, but no luck! The doors were locked and a last video recording was taken at 17.18 where 14 was doing some knees bend teetering on the edge of the nest. ‘17.19 – We’ll have to call it a day,’ In the split second of turning back to the screen a blur of tail feathers disappeared up and out of the picture. With a feeling of shock we realised he’d gone! Zooming the picture out, there lay the fields and trees touched golden with the setting sun but no signs of 14. We need not have worried, half an hour later 2 Volunteers watching from a good vantage point spotted 3 birds in the sky. KL and her mate with their first airborne chick. One of our volunteers, Josh, captured some nice film today while on duty at Whinlatter. Both Chicks are on the nest, one is doing some excercise. KL joins them on the nest, then the Male arrives with a headless fish, which KL takes and begins to feed the chicks as the male leaves….happy families indeed !